Starcraft II is as intimidating as games come, but Blizzard is taking measures to make StarCraft space a much friendlier place by bringing back “Spawning” to the game's Starter Edition. The concept of Spawning harkens back to the days of Warcraft II and the original Starcraft, where people could play with friends who didn't own the game disc (remember those? 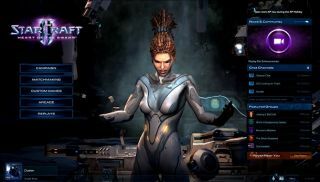 ).Those who didn't buy StarCraft II can download the free-to-play Starter Edition , which allows newcomers to try out the popular RTS' first few missions and face the A.I. in multiplayer—not people made of flesh and blood. Now that Spawning has been added to the Starter Edition players can now duke it out online with their Wings of Liberty and Heart of the Swarm buddies—as long as they're in the same Battle.net party. Starter Edition players will have access to the same units and custom maps as the player with the highest-level expansion in their party, all A.I. modes, ranked and unranked team ladder matches and access to the arcade. Spawning applies to Wings of Liberties players as well, allowing those who don't own the latest expansion to play with friends who do. However, Spawning won't dish out all of StarCraft II's goods for free. You still won't have access to the full single-player campaign or clans and groups, and you can only play as the Starter Edition's activated multiplayer race (which is currently Terran). The current Battle.net party limit is 15, so WOL and HOTS players could potentially "spawn"14 friends at once. Still, it's a neat feature for those who have companions that are somewhat interested in joining your online escapades. My attempts at bringing my non StarCraft-playing friends into the fold have left me with only sour looks, but maybe you'll have better luck. Blizzard's adding Spawning to the various regions throughout the day, so if you don't see it now, it should be there shortly.